Unlike the last few seasons, there was something of the feel of starting a new school (rather than simply returning from the holidays) about last weekend’s season opener. The familiar drive down the M1 to Daventry was replaced by the somewhat more varied scenery of the A38 and A5 and, despite a 15 minute holdup for a small hole at the side of the road, we arrived in good time. 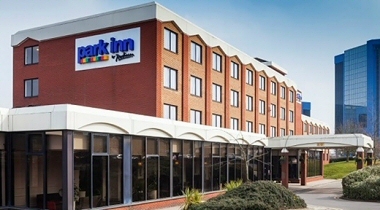 The hotel was easy to spot and, after negotiating the car parking procedure, we set off to explore the new surroundings. The playing rooms looked fine, with plenty of space and good lighting, and the tables outside them well stocked with water. I didn’t have a camera with me, but the Hotel’s own photographs show the surroundings nicely. Both rounds were preceded by the usual talk from the arbiter on the logistics. Each time enhanced by a demonstration of the new security procedures. Playing in a different room each day, I had the benefit of seeing two different performances - this was when the lack of a camera was felt most! 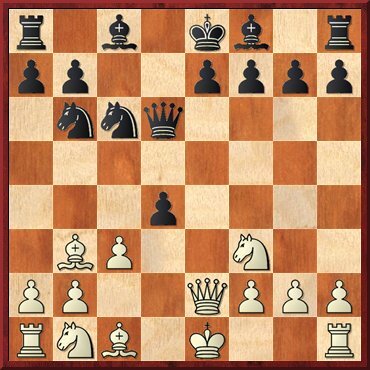 Once the chess started, the playing conditions proved to be very good. Not too hot or cold, very quiet, and the water supplies remained well stocked throughout, so far as I could tell. A further change for this season is, of course, the splitting of the old Division 3 into Division 3 South and Division 4. The former taking the same format as the top two divisions and introducing a different feel to the event for those of us involved – and I suspect an added incentive to those playing in Division 4 this year. My general impression is that the two groups of Division 3 South will be much more closely contested than it seemed at the end of last season. In Pool A the average rating varied from Shropshire (2141) to The Rookies (1955), while in Pool B it was even closer from Surbiton (2072) to CSC Rhinos (1948). Meanwhile in Division 4, there seems to be a dichotomy between the eight teams who are roughly 1880+ and those below 1700-ish, with a couple in-between. However there are a lot of juniors playing and it will be interesting to see how things develop. Pool A favourites, Shropshire, didn’t have things all their own way, drawing two hard fought matches. Performance of the weekend for this group was probably Midland Monarchs win over Oxford (who bounced back to draw with Shropshire the following day). West is Best are the early leaders of the pool as the only team with 4 points, while all the teams gained at least 1 point. Given the closer ratings in Pool B, it is somewhat surprising that we have three teams on 4 points (Surbiton, Wessex and Ashfield-Breadsall) and three yet to get off the mark. Though the spread of game points isn’t dissimilar to Pool A and almost all the matches went “with rating”. So I’d expect to see this group tighten up too in the coming rounds. The upset of the weekend in Pool B was CSC Rhinos win over Warwickshire Select. The “top eight” are currently occupying most of the top 10 places, but there are a couple of teams around 1800 (Cambridge University and Hackney) who are currently also in amongst that top group. In Round 1 there were a couple if upsets with Iceni 1 losing to Throw in the Tal 1, whilst there was an even more impressive win for Sussex Martlets against Barnet Knights 1 (the only team rated over 2000 in the division). In Round 2, Iceni 2 beat CSC Hippos to “balance the books” for the Iceni. The two teams that provided the upsets in Round 1, Throw in the Tal 1 and Sussex Martlets, are joined by The Full Ponty (the second highest rated team) on 4 points. I propose to pick one game from each weekend to analyse and publish here. It might be a very good game in itself, or important as part of a team performance, or just something that takes my eye. If you have any contenders, please let me know. At the risk of losing my newfound “ace reporter” role, I’m going to start with Mike Truran’s defeat by Maria Manelidou from Greece. It was a one of the games that contributed to Midland Monarchs upset win over Oxford 2, and I hope you will agree was an exciting battle. 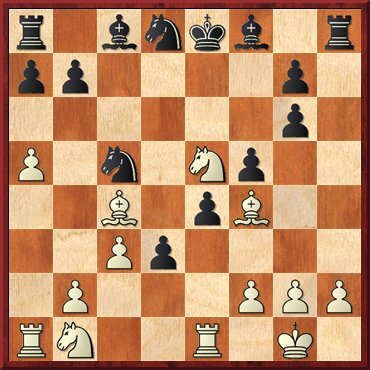 The following position after white’s 20th move is a taster! Any idea what the opening was? 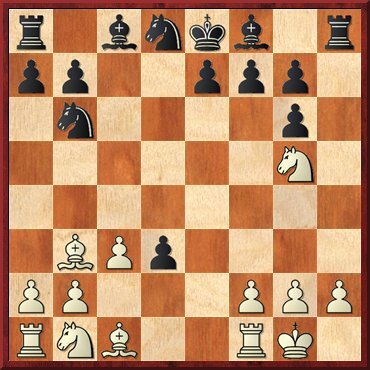 My analysis is backed by the tactical skills of Komodo 9, but I do try to understand and point out why its moves may be preferable. One thing to look out for, which I noticed when annotating the game, is that most of the suggested improvements in this game are either developing or attacking moves – something to ponder for us all. 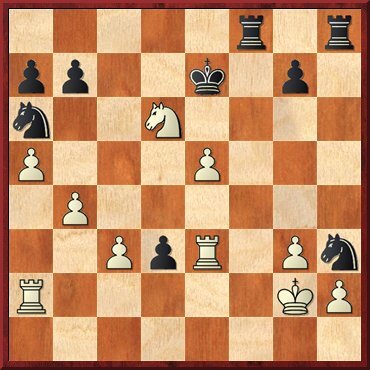 10...d3 11.Qe4? 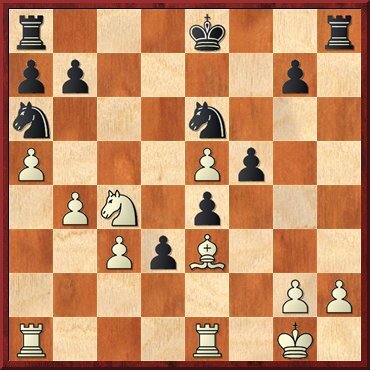 !=/+ This looks logical, allowing room for white to bring out her queenside pieces, but Komodo suggests white must play 11.Qe3 to keep her opening advantage, e.g. 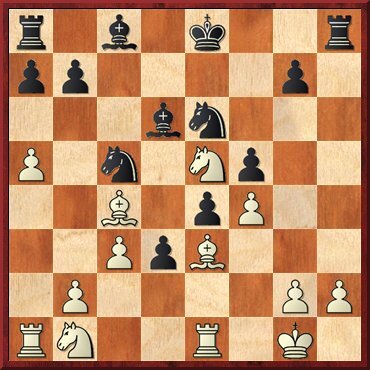 11...Bf5 12.Na3 e6 13.Nh4 Qc5 14.Qxc5 Bxc5 15.Nxf5 exf5 16.Re1+ Kf8 17.Be3 Nd7 18.Rad1+/= completing development. 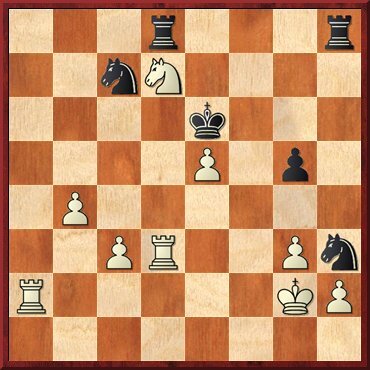 36...Ke6?+/= After a lot of good play by both sides, I guess that the clock may have had something to do with black's demise over this move and the next.